Long before his legendary career in the secret service, we meet 13 year-old James at Eton in the Young Bond series of books by Charlie Higson. As a schoolboy James is no stranger to danger, getting himself into some close scrapes as he single-handedly uncovers sinister plots and embarks on exciting adventures in the first two Young Bond books SilverFin and Blood Fever. 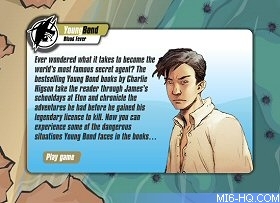 Driving and Sea Urchins are two flash games inspired by some of the many adventures Young Bond faces. Now you can play these Young Bond games on MI6! 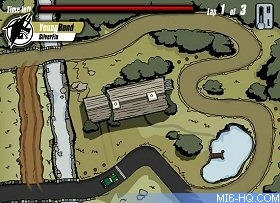 Driving is set in England and is based on a scene from the first book SilverFin, where a young James is taught to drive his uncle’s car at his countryside cottage. To show off his newly acquired skill James must complete three circuits of the cottage before the timer runs out, trying not to scratch the car. Driving is controlled predominantly by using the arrow keys with the space bar used to switch between high and low gear when needed. Sea Urchins finds our hero in a prickly situation while on the school trip to Sardinia featured in the second book Blood Fever. While visiting Victor on the island James finds himself in the sea navigating between sea urchins to get to the shore unscathed. In this game James must use the arrow keys to swim in-between the clusters, however, as waves come in the urchins move, meaning that players must be ready to react at a second’s notice. Both Driving and Sea Urchins feature as part of the SilverFin and Blood Fever interactive games on YoungBond.com; the official Young Bond website. These games feature downloads to collect as well as multiple flash minigames and hidden features to uncover.